It’s winter time in our Nation’s Capital! The New Year is well underway, and as we’ve carefully selected our resolutions (and have spent the majority of these last few weeks trying to abide by them) we reminisce on the post-joys of Christmas and the excitement of a New Year. However, regardless the amount of joy in our hearts and happiness in our homes, the cold weather tends to overstay its welcome far too often. Admit it, we’ll soon catch ourselves wishing for less snow, warmer weather, and oodles upon oodles of sunshine. Wishful thinking, I’ll say. Truth is, we live in Ottawa – and let’s face it – Ottawa is just simply cold. This said, however, our City just so happens to be celebrating its 150th Anniversary this year, and has planned for an endless list of fun-filled, family-friendly, wintery activities that are sure to help kick those winter blues. 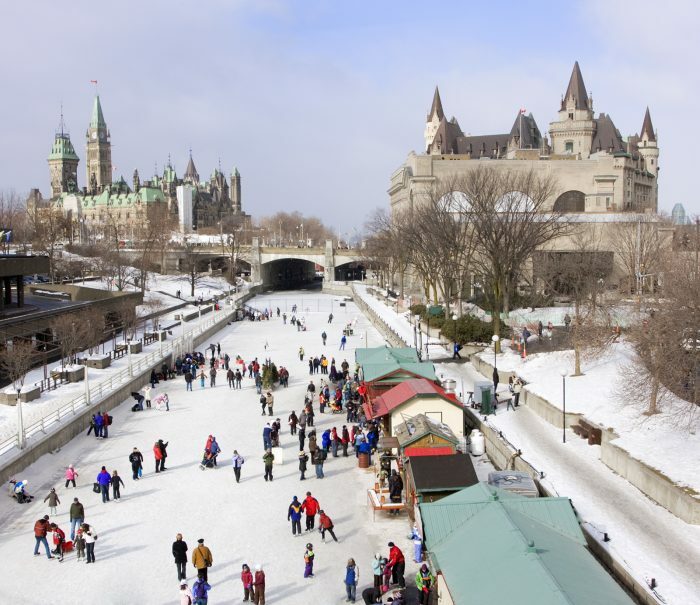 After a good skate or two, why not enjoy the rest of the activities that our Capital has to offer at our largest winter celebration: Winterlude. Officially underway, Winterlude has been a “unique way to celebrate Canada’s unique northern climate and culture since 1979”. You’ll welcome the Ice Hog Family as they travel once again to our City, as they do each year. Bring your family along and pay them a visit at the Snowflake Kingdom in Gatineau. From there, you’ll walk among the many ice sculptures that are created for the ice sculptor competitions, and frolic in what’s considered to be North America’s largest winter playground. Winterlude 2017 wraps up on February 20th – won’t want to miss out! Follow this link to the event’s website for more details. Maybe you and your family appreciate a good, healthy challenge or two once the snow falls – kudos to you! If your family is one for the slopes (and perhaps even a small weekend getaway) then you’re in luck! Ottawa is surrounded by multiple snow hills and downhill skiing sites that are bound to keep you and your loved ones busy and buzzing with adventure this winter. Pack up the car and head to Mont Cascades, Mont Saint-Marie, Mount Pakenham, or even Camp Fortune this weekend. Take your pick! The temperatures are perfect, and the snow is just right. And if the downhill slopes aren’t exactly your forte, why not feed your outdoor passion for skiing cross-country style at one of two of “Ottawa’s treasured parks: Gatineau Park and/or Greenbelt Park” (Link: http://www.albertatbay.com/location/things-to-do/winter-activities). Ottawa has reached an exciting milestone. This year, our Country will celebrate its 150th Anniversary. Needless to say, it’s time to celebrate. Keep an eye out for ongoing activities around our City by following this link! Stay safe, have fun, and happy celebrating! The post Beating the Winter Blues appeared first on Team Realty. Buyer representation: Are you a client or a customer? New home construction: How a REALTOR® can help.